Trumpet vine (Campsis radicans): growing, planting, caring. A vigorous, deciduous woody vine with showy trumpet-shaped orange to red flowers. 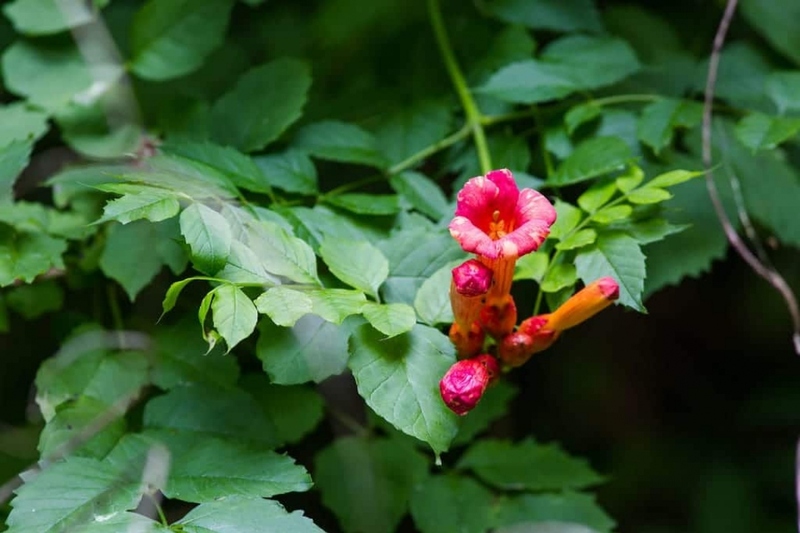 Campsis radicans - the trumpet vine or hummingbird vine - is a species of flowering plant of the family Bignoniaceae, native to the eastern United States and naturalized in other parts of the world, growing to 10 m (33 ft), notable for its showy trumpet-shaped flowers. It inhabits woodlands and riverbanks, and is also a popular garden plant. The leaves are opposite, ovate, pinnate, from emerald green when new, to dark green, and the flowers come in terminal cymes of 4–12, orange to red in colour with a yellowish throat. Some species are frost-sensitive and some less - but all love a warm climate. The trumpet vine is a shrub that is grown as an ornamental for its orange trumpet flowers that bloom from July to September. Rarely parasitized or ill, it is remarkably resistant to heat and drought, and can grow up by one meter per year. The leaves are deciduous, toothed, dark green, lanceolate, the stems have the particularity to emit adventitious roots - hence its Latin name radicans - in the form of claws that allow the plant to attach to anything, tree or wall, that it covers while climbing there. The flowers bloom from July to September, on the twigs of the year. Transplant your trumpet vine in the garden in the spring, which is preferable for colder regions, or in the fall. Prefer a sunny and warm situation, sheltered from icy drafts in winter that can burn buds. Prepare a planting hole with coarse gravel or tile shards for drainage, then a mixture of potting soil and garden soil. Tilt the mound to its future support! As it likes to have cool roots, a tile or board should cover the base. As soon as it is dries, watering will be welcome during the 3 years following planting. The first months of the plant, water regularly, and during the hot weather you can do a regular but limited watering, in the evening. In pots, monitor the substrate, and water if it is dry. Renew the top of the substrate - in the spring, adding a little compost when your plant shows signs of exhaustion. Cutting is easy and is done in the summer, but the flowering is longer to obtain. Propagation is also done by layering in the spring, leaving a branch crawling on the ground, then burying it 20 cm at the level of the aerial roots and keeping it down with staples. Straighten the end of the branch and attach it to a support. In the autumn or the following spring you should be able to separate the marcotte from the original plant. In Spring, prune your trumpet vine severely, like a vine. Keep only one or two big branches. Trim down all the branches that have bloomed the previous year, leaving only 2 or 3 buds. After a few years, you will only have to remove the dead branches with pruning shears, aerate the center of the plant, and cut the shoots of the previous year above to 2 or 3 buds. It's a climber! Like ivy it clings to its support with tendrils, often very vigorously, but it needs a solid enough support. Watch for its growth: some varieties need to be trellised because their crampons are not enough or strong enough. Mulch your plant before the frosts, with what you have: dead leaves, dry grass clippings, straw!